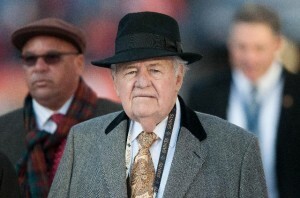 After his granddaughter, Rita Benson, and her mother and brother filed the case seeking to have him declared incompetent and unable to make reasoned decisions, Tom Benson was so upset that he issued a press release expressing his “extreme disappointment“. He wrote that the legal case strengthened his resolve to fight and he instructed his attorney to “spare no effort” defending his decisions and his rights. What decisions needed defending? Primarily, it was Tom Benson’s decision to leave control of his sports franchises and other business interests to his third-wife, Gayle Benson, instead of to his granddaughter, Rita Benson. On December 27, 2014, Benson wrote a letter to Rita, and her brother and mother, blaming them for causing family drama, informing them that he was leaving his controlling interest in the Saints and Pelicans to his wife, as well as locking them out of his businesses. These decisions directly prompted the competency lawsuit, as the three heirs claimed that Gayle controlled and unduly influenced Tom Benson, who they felt was no longer competent. We wrote about this case shortly after it started, pointing out that one of the keys to the competency dispute would be how Benson fared in court-ordered doctor evaluations. Two of the three experts selected (one chosen by each side, with only one being neutral) testified in court that they found that Tom Benson was not vulnerable to undue influence and suffered from only mild cognitive impairment that impacted his short term memory. In other words, they felt he was competent and suffered from only limited deficits, which are not unusual for someone who is 87 years old. The Judge also wrote about Benson’s mental fog that may have existed in December, due to recovering from surgeries and medications he was taking, but the Judge felt the fog was cleared by the time he interviewed Benson as part of the court proceeding. Importantly, the Judge pointed out that Benson unequivocally and definitely affirmed his prior decisions to place Gayle, not Rita, in control of his business and sports empire. What does this mean for the larger dispute? This court decision resolved the Interdiction proceeding — which is the term that Louisiana law uses for what other states refer to as guardianship or conservatorship proceedings. This means that the Benson heirs failed to prove by clear and convincing evidence that Tom Benson was incapable of making reasoned decisions as to his person or property. The heirs are appealing the competency ruling, arguing that Tom Benson should have been required to testify on the stand at the hearing, instead of just meeting with the Judge. Appeals of competency determinations are rarely successful, however. Even if the appeal fails, the ruling does not mean that Rita and the others would be unable to challenge whatever changes Benson made to his estate and succession planning at a later date, likely after he dies. Instead, that new proceeding would be subject to a lower burden of proof, which is standard in most civil lawsuits. Also, the new case would likely be decided by a jury instead of a judge. However, the court’s findings and the testimony developed in this case will make it harder for Tom Benson’s family to prevail in a later lawsuit, based on the finding that Benson affirmed his prior decisions at a time when the Judge and two psychiatrists felt he was capable of doing so. This ruling also doesn’t end the other two lawsuits that are currently pending between the same Benson family members. Tom Benson had previously created irrevocable trusts that left some of his business interests (including the Saints and Pelicans) to Rita Benson and the other heirs, but not controlling interest. Benson now is seeking to remove those business interests and replace them with promissory notes, secured by his assets. In other words, he wants to give his three heirs cash down the road but does not want them to have any interest in his sports franchises and other businesses. What does this mean for your family? The Tom Benson family dispute teaches two important lessons. First, filing for guardianship or conservatorship is seldom a simple decision to make when a family member is mentally impaired but believes he or she is competent. Dementia and other forms of cognitive impairment do not come with a clear-cut dividing line between “competent” and “incompetent.” There is a large grey area in the middle, and the level of capacity can change from day to day or even moment to moment. Anyone planning to begin a proceeding like this should carefully weigh the risks of angering and alienating the elderly family member. Second, anyone considering using an irrevocable trust as part of comprehensive estate planning should also consider the risks. As Tom Benson demonstrates, even if the trust creator changes his or her mind, an irrevocable trust cannot be changed. Sometimes there is a little wiggle room in the trust language (which is how Tom Benson can try to substitute promissory notes in place of business interests) but there is a significant loss of control. This reality should be balanced against the tax savings and other potential benefits that irrevocable trusts can offer. If you find yourself facing either type of decision, it is important to consult with an experienced estate or probate attorney who can help balance the pros and cons and hopefully steer your family clear of an ugly court battle.